Nürnberg, In Verlegung J.A. Endters, 1690. Martin Luther asserted that the Bible was the ultimate recourse, without a single authoritative interpreter. This tenet of sola scriptura, the literal belief in a holistic Bible, demanded a version understandable to the common people. 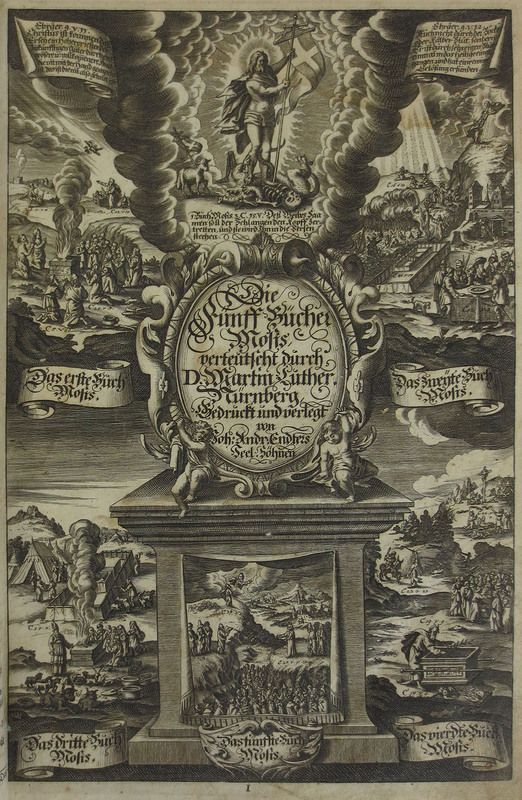 Luther thus began his own vernacular German translation with characteristic illustrations of Biblical scenes to fill the need for an accessible Bible. The Bible, printed in columns with verse numbering and marginalia, was widely circulated in reprints such as this 1690 version printed in Nurnberg. Luther's Bible, typeset in Gothic blackletter, contains uniquely German elements. The text was influenced by German religious oral tradition; the translation transforms the text into the vernacular rather than following the syntax of the original tongues. This was a translation crafted to be read aloud and savored in the local language. The Luther Bible is a fine example of vernacular German prose, and an important part of that country's literary heritage.